Pretoria (VNA) – The Vietnam Buddhist Sangha (VBS) Central Committee has recently held a grand ceremony in Maputo, Mozambique, to make public the Vietnam Buddhist Association (VBA) and launch the plan to establish a Vietnamese Buddhist Centre in Mozambique, also the first of its kind in Africa. 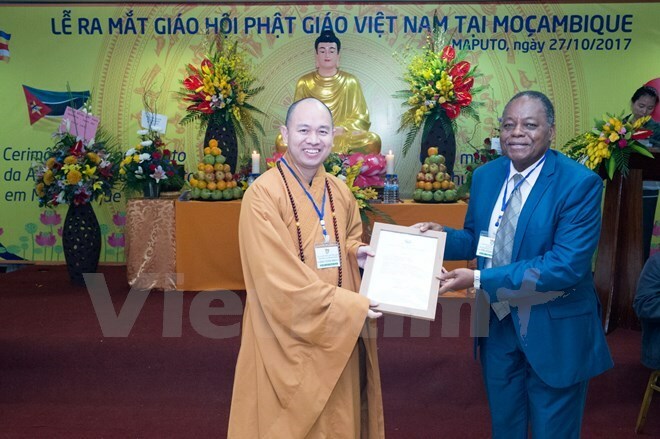 Addressing the event, Most Venerable Thich Duc Thien, General Secretary of the VBS Executive Council, spoke highly of Mozambique’s licensing of the VBA and expressed his hope that the association will contribute to strengthening solidarity among the Vietnamese community in the country, and consolidating friendship between the two nations. He said the VBS will build a Vietnamese Cultural Centre covering more than four hectares in Mozambique, with a pagoda in the centre. Arao Litsuri, a representative from the Mozambican Government, expressed his hope that Vietnamese Buddhist followers will introduce Vietnamese culture to local people and contribute to charity activities and poverty reduction in the country. On this occasion, the VBS presented 300 schoolbags to poor students in Mozambique’s mountainous province of Tete via the Mozambican Ministry of Education and Culture./.